We are now in full playoff swing as we have reached the second round of the Stanley Cup but unfortunately for the Los Angeles Kings is has just been two weeks of golf and no hockey. Since Kings news is few and far between during playoff hockey there is only one thing we can talk about, the NHL Draft and no, two months is not too early to talk NHL Draft! Evander Kane will likely be a top eight pick in this years NHL entry draft. A few weeks ago I spoke of how the Los Angeles Kings should target Brampton forward Matt Duchene in the 2009 Draft, but in the recent ISS rankings the scouts have put Duchene above highly touted prospect John Tavares. Going on the rankings it seems unlikely that the Kings will luck out and have Duchene fall to them at five. I have now attempted to shift focus on a new prospect that the Kings should target, Vancouver forward Evander Kane. 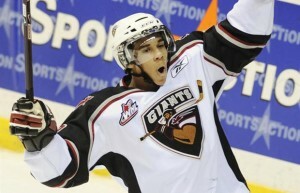 Kane has enjoyed a great season in the WHL, recording 48 goals, 48 assists and 89 penalty minutes in 61 games with the Vancouver Giants. Even with Kane’s smaller stature at 6ft and 170 lbs. he has been a physical presence in the WHL and if he he continues to grow and gain weight he could still bring that physicality to the NHL. Kane is a tremendous skater and great stick handling capabilities which will translate well from juniors to the NHL but would he be ready next season? It is unlikely that Kane would reach the NHL ranks next season unless he wows coachs at training camp and another year in juniors would likely benifit him, growth wise. Even though the Kings are once again picking in the top five in the NHL draft and not taking part in the playoffs, there is cause for great hope as these high draft picks will likely translate into the Kings making the playoffs in the near future.